Our skillet lasagna is ready to eat in just over an hour and is the perfect solution to add a new twist to an old favorite, by using ingredients you probably already have on hand. Transform your skillet into a lasagna pan. I love my kitchen pots and pans almost like a parent loves their children. Much to the bewilderment of my husband and kids, I’ve even named several of my favorites. If had to choose a favorite among them though, the granddaddy of them all would probably be my cast iron skillet. There’s virtually no kitchen task that my cast iron skillet is unable to conquer. I use it for baking breakfast skillets, skillet potpies, and even skillet dessert recipes. Today, I’m showing you how I make skillet lasagna. Use what you have on hand for this skillet lasagna. My cast iron skillet isn’t the only thing that puts this easy lasagna recipe ahead of other recipes. It’s also the ordinary ingredients we use to make this simple comfort food meal. 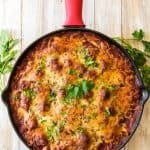 For this cast iron lasagna, we use shell pasta instead of traditional lasagna noodles and Italian turkey sausage instead of pork sausage or beef. 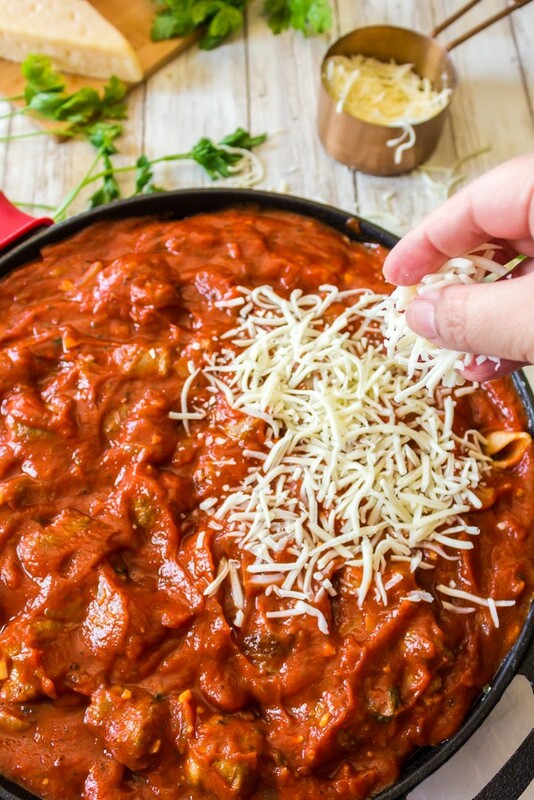 Use Italian turkey sausage for a healthier skillet lasagna. I’m hoping I’ve caught your attention at this point and so let’s get started in making this easy lasagna. 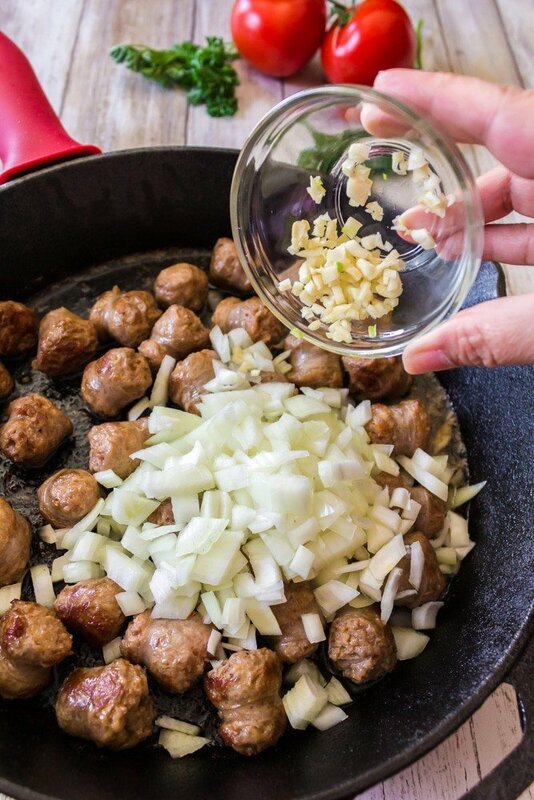 Fresh minced garlic and onion are added to the skillet of browned sausage. Like many traditional forms of the recipe, this cast iron lasagna starts with browning some sausage, along with the usual aromatics like onion and fresh garlic. 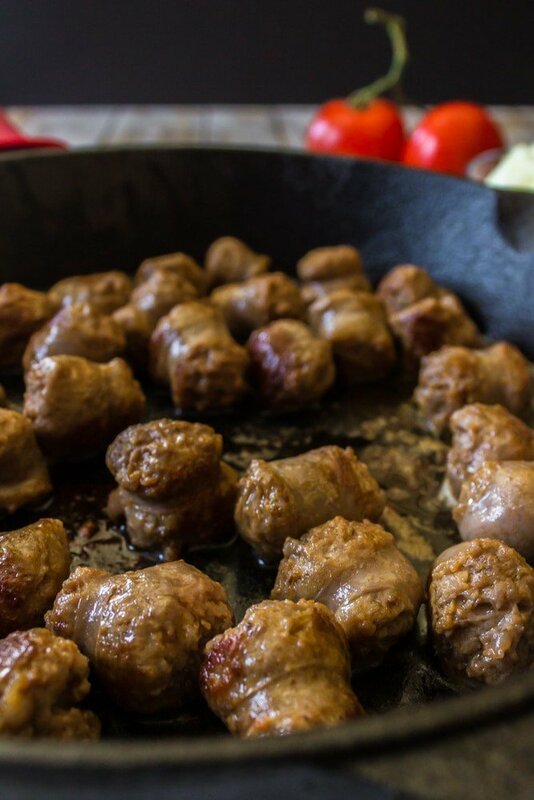 We make this version with Italian turkey sausage for a little less fat and without sacrificing any flavor. Use your favorite tomato sauce when making this cast iron lasagna. Next, we add some tomato sauce. 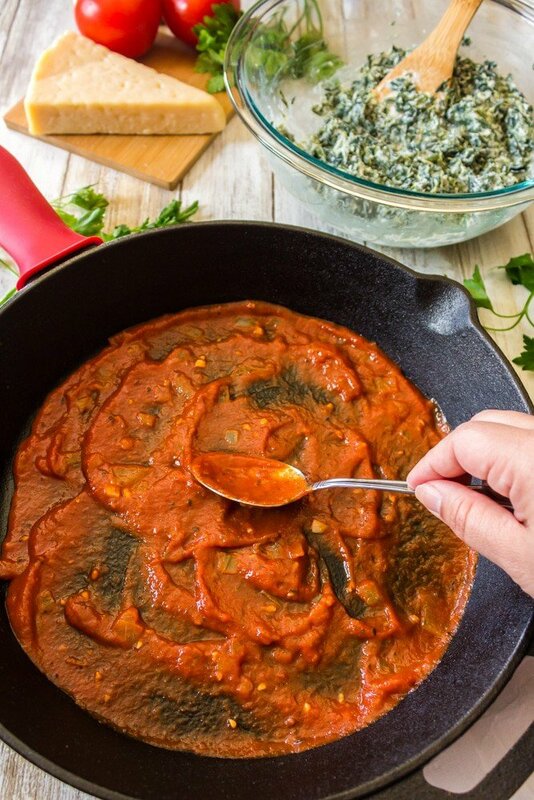 Use your favorite marinara or try our awesome Slow Cooked Tomato Sauce with Roasted Sweet Peppers. It’s seriously the best tomato sauce ever! 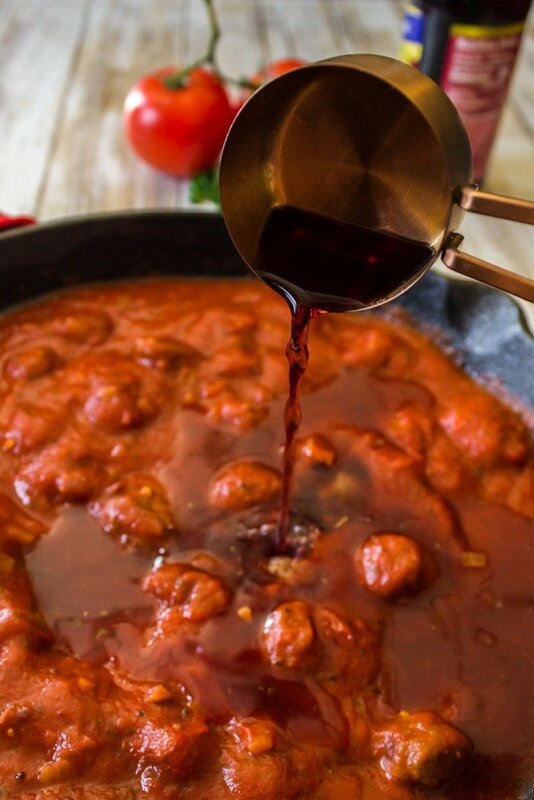 A little red wine will add a lot of flavor to this lasagna sauce. A little tomato paste is added to this easy lasagna sauce, with some Italian seasoning and a little bit of red wine. Now that all the sauce ingredients are cooking in the skillet, it’s a good time to put a pot of boiling water on the stove and cook a box of medium-size pasta shells. Cook them for a minute or two less than directed on the box. You want the shells to be al dente (to the tooth) because they will continue to cook while when the skillet goes in the hot oven. 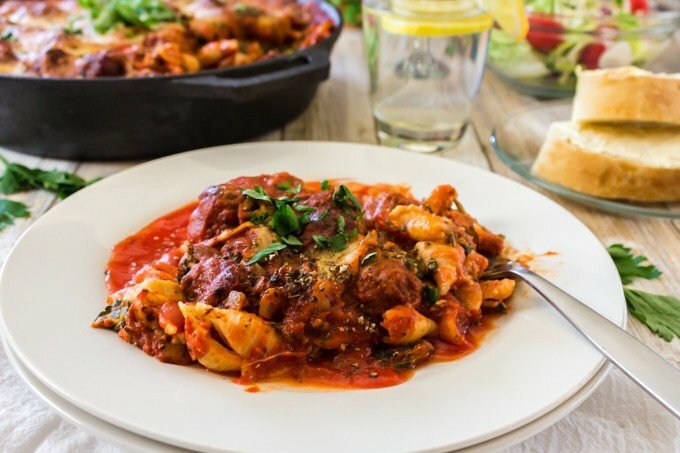 Use pasta shells for this skillet lasagna. What’s the Best Wine for Spaghetti Sauce or Lasagna Sauce? A good rule of thumb is to use a red wine that you enjoy. If you’re not a wine drinker, don’t go for the cheapest red wine you can find, or your lasagna will reflect the wine’s quality. You should be able to find a decent, full body red wine for $10 to $15. Thus you don’t have to go with high-end wine either. 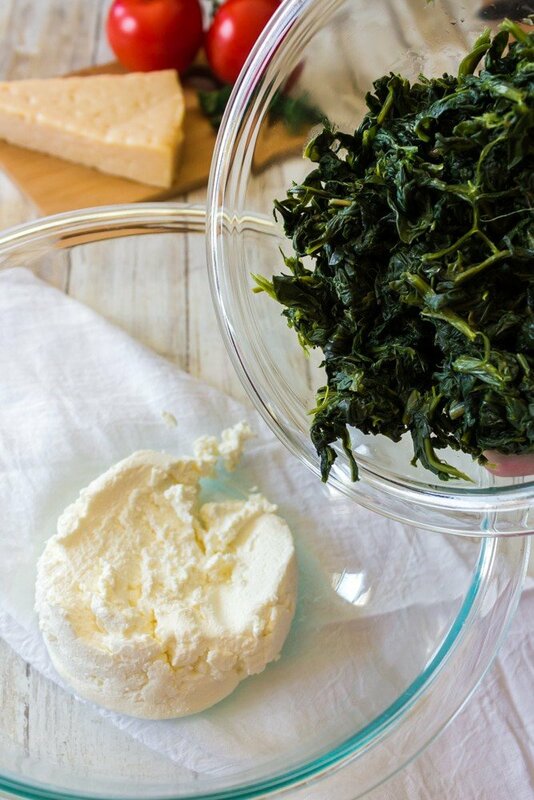 Use a thawed and drained boxy of chop frozen spinach to add to the ricotta cheese. Like many lasagna recipes, we use a mixture of egg, ricotta cheese, and spinach for this skillet lasagna. 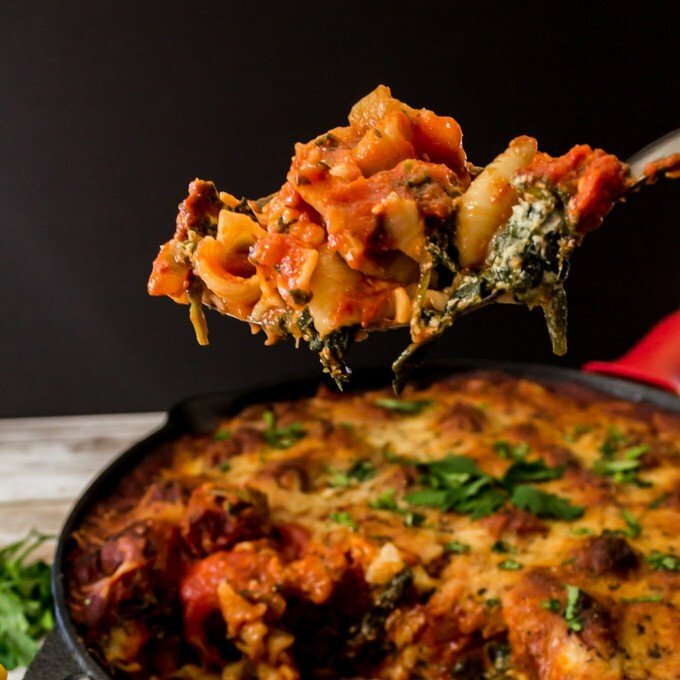 Remember, this skillet lasagna recipe is all about convenience. 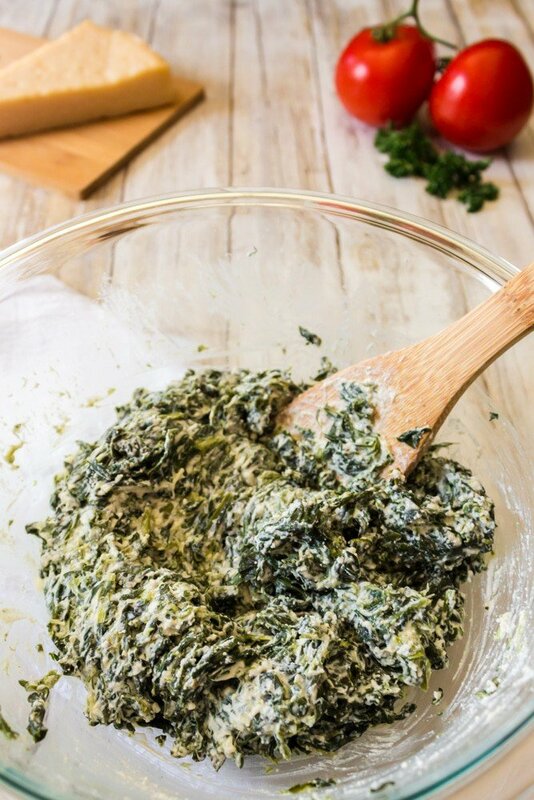 Use some chopped frozen spinach to add to the ricotta cheese, making sure you squeeze as much water as you can out of the spinach before adding it. 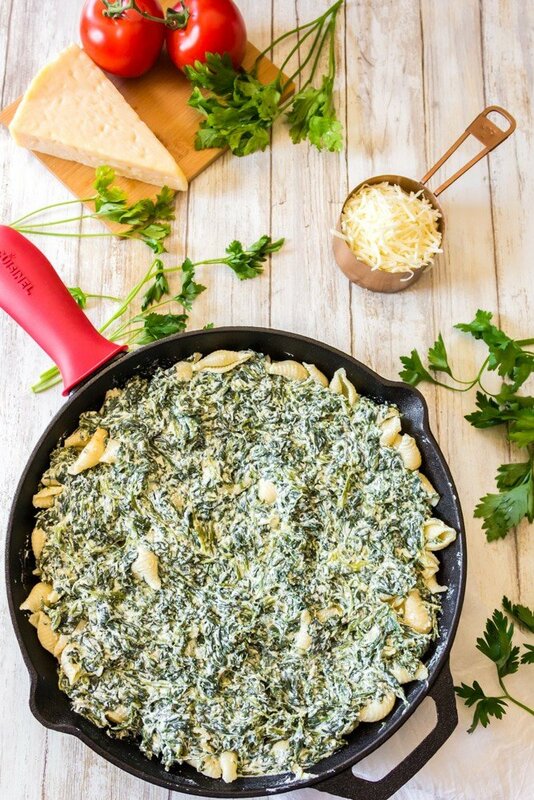 For added flavor, you can add some grated Parmesan cheese to this spinach and ricotta mixture. If you’re feeling adventurous and want to try something new, try our easy recipe for homemade ricotta cheese! Feel free to explore your tastes with adding a handful of grated hard Italian cheese, like Parmesan or my favorite, Romano. It’s time to start building your cast iron lasagna! Now that the sauce is made, the pasta is cooked and drained, and the cheese mixture is put together, it’s time to build this skillet lasagna. Start by transferring the sausage and sauce to another bowl. Then, spread a small layer of the sauce in the bottom of the skillet. Spread the drained pasta shells on top of the thin layer of sauce, then add the cheese and spinach layer. 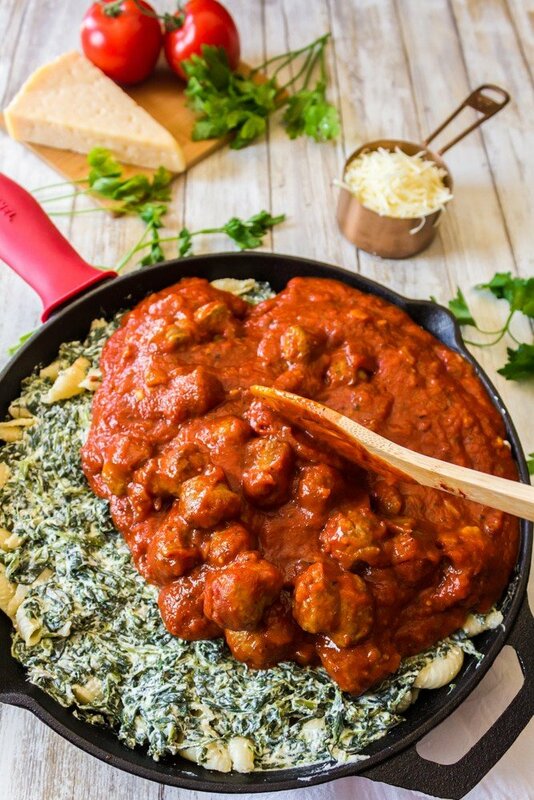 The layers of this skillet lasagna are just like a traditional pan lasagna, except we only use one layer of each part. Spread the cheese and spinach layer evenly over the cooked shells. As you build the layers of this skillet lasagna recipe, feel free to sprinkle on a little extra Parmesan cheese, or whatever cheese that you prefer. Don’t let the size of this skillet lasagna fool you! It will feed a crowd. Now it’s time to return the sausage and sauce mixture to the skillet, spread it evenly over the layer of spinach and ricotta. Finally, crown this cast iron lasagna with a sprinkling of Parmesan cheese. The last stop of putting this skillet lasagna together is to top it with some Mozzarella cheese. You’re going to bake this for one hour at 350°. Once it comes out of the oven, give it another sprinkling of Mozzarella or Parmesan cheese on top, and some chopped fresh basil leaves. Allow this baby to set for 10 to 15 minutes before serving, if humanly possible. Once your skillet lasagna comes out of the oven, allow it to rest for a few minutes. 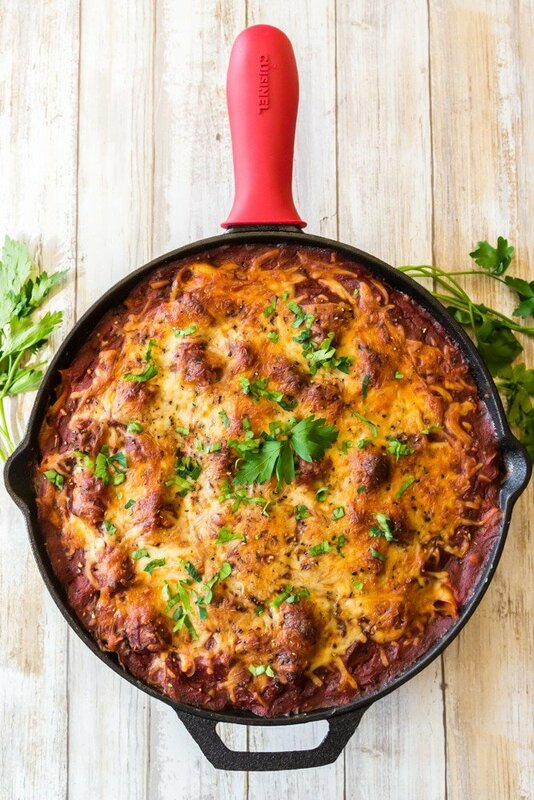 This cast iron skillet lasagna is a meal all by itself. If you want to add to the spread, our crusty homemade bread and a green salad will take you all the way! A green salad and crusty homemade bread are the perfect compliments to this skillet lasagna. 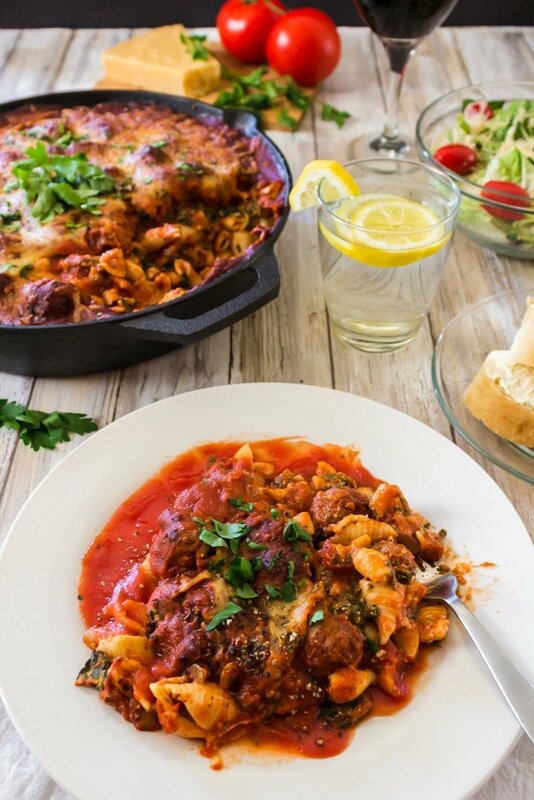 Like most tomatoe sauce-based recipes, this skillet lasagna recipe tastes even better a day or two later. You can even freeze it and make a delicious leftover meal out of it for a future date. I love this kitchen wrap, which Costco sells. It has a slider to cut the plastic and makes it super easy to cut without having any excess wrap stick to itself and make a big tangled wad of plastic wrap that ends up going in the garbage. Use a label to mark the date and then put in your freezer. When ready to eat, allow it to thaw in the fridge, or defrost in the microwave. Reheat in oven or microwave and top with some fresh, warm marinara sauce! 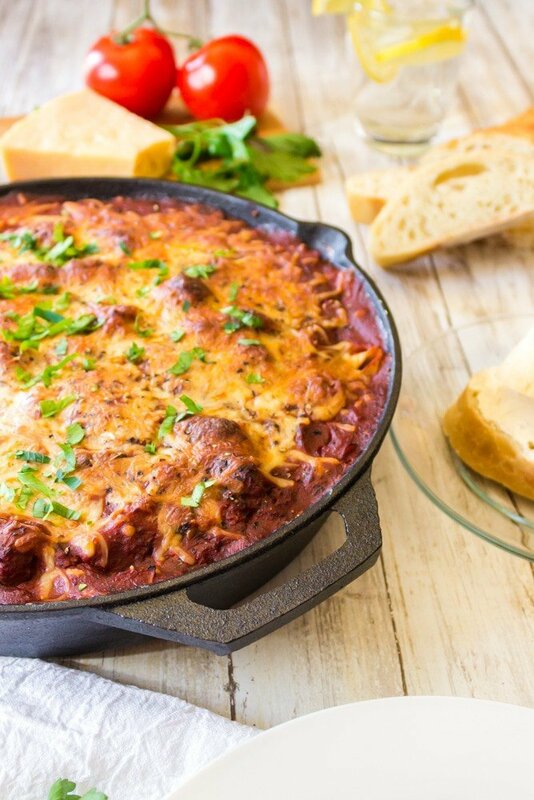 This skillet lasagna recipe is a fast and delicious meal that only takes an hour to bake. As a bonus, you can freeze the leftovers and enjoy this iron skillet lasagna down again and again! Using large oven safe skillet, heat oil over high flame. Brown sausage, reduce heat and add onion and garlic, saute till soft and translucent. Add tomato sauce and paste along with wine and seasoning to pan of sausage and stir well while simmering. Meanwhile, prepare pasta in boiling water, as directed on package. 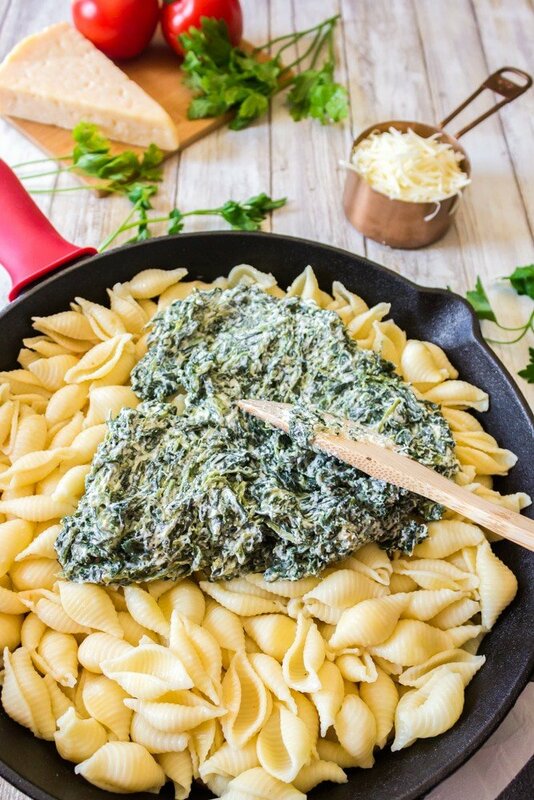 While pasta is boiling, combine ricotta cheese, spinach, and egg in small mixing bowl. Mix together thoroughly. 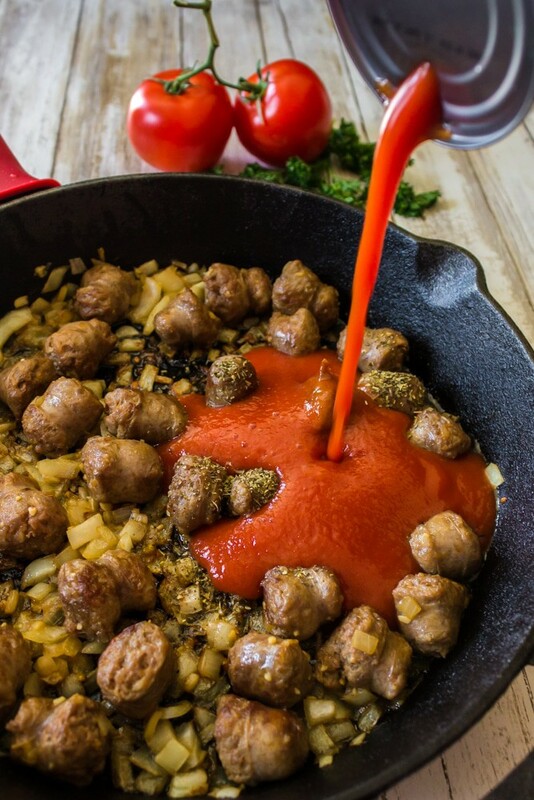 Transfer sausage and sauce to large bowl, reserving skillet. Remove pasta from heat when done, and drain thoroughly. Take about a half cup of sauce and coat bottom of skillet. 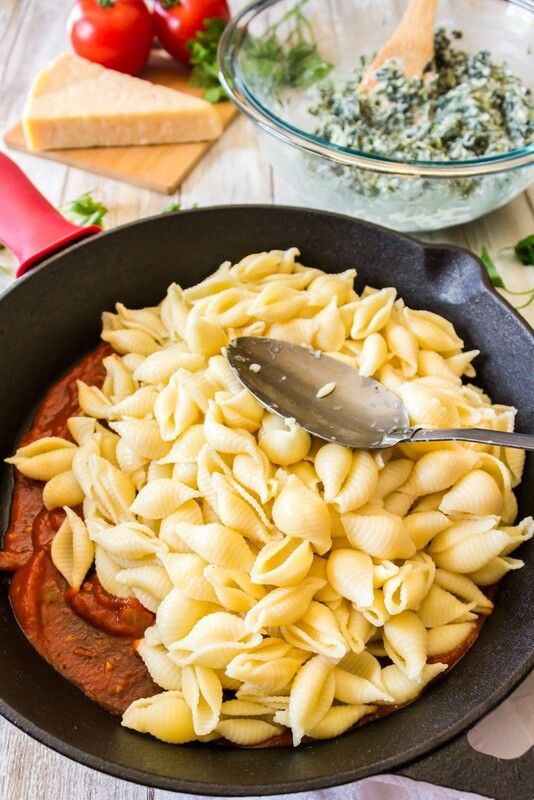 Place drained pasta shells in skillet and distribute evenly. Spread ricotta mixture over shells, using the back of a wooden spoon to spread evenly. Pour sausage and sauce mixture on top of ricotta, spread evenly. Remove from oven and allow to set for 15 minutes prior to serving. Serve with additional (warm) sauce after baking, if desired. yummy!!! I always put spinach in my lasagna- it’s my fav! This sounds delicious-perfect for hungry families! And I don’t know about you, but I always feel like I’ve really accomplished something when I create a fabulous meal out of scavenged pantry items! This looks delish. 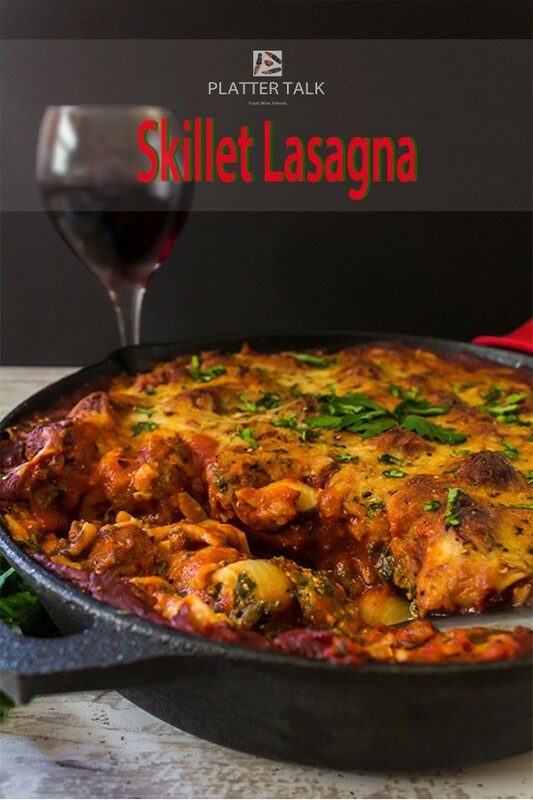 Love the idea of making lasagna in a skillet and using shells. Plus this one has hidden veggies, so major yum and nutritional boost! Necessity is the mother of invention, as they say! This skillet lasagna like so good and so impressive as a spur-of-the-moment recipe! Quick and easy, my kind of recipe! Pinned. This looks great! 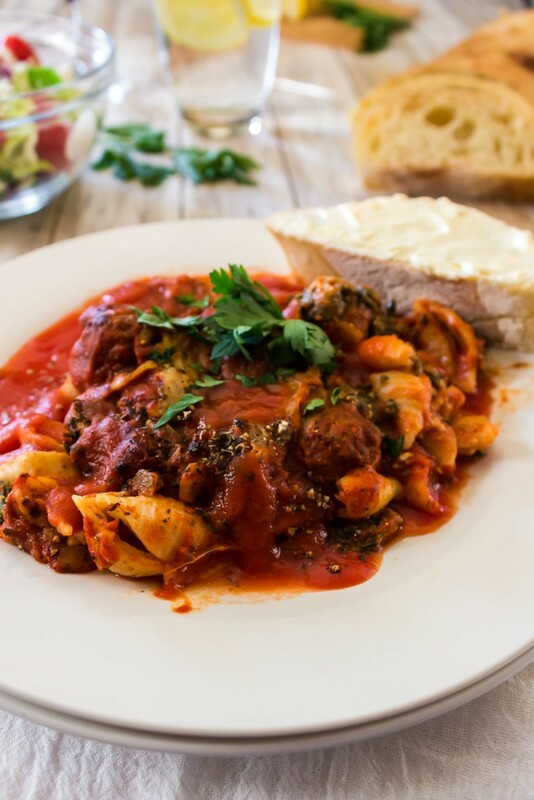 I LOVE Italian food and am always looking for quick and easy ideas. Can’t wait to give this a try! Thanks for the comments, this is an quick and easy alternative to traditional lasagna! Looks good to me, especially the “no need to turn on the oven” part. I always enjoy the challenge of making something from nothing. Well, enjoy it after the fact — it can be kinda stressful until I figure out what I’m going to cook! Anyway, this really is a super dish — loads and loads of flavor, plus a really interesting twist on a traditional lasagna. Good stuff! Thanks. Thanks, John. This one was fun and tasty! I know there were no leftovers left at your house! So hearty and I’m sure quite fun to make! Thank you for another incredible dish! This looks so good! The color so rich, what a flavorful and fun family meal! Well lucky for the boys, you had your thinking cap on. Brilliant rendition.